Our Report on Europe voices a rather severe judgment regarding the process of unification and the current approach adopted by the European Union, and this unto the point of considering it a failure with respect to some of its features, as the title of the Report indicates, and even a danger. We know very well that such an assessment differs from what is heard in both Church-speak and politics-speak, where the slogan is “more Europe is needed”. We also know that the critics of the European Union are accused of identity populism. Nonetheless, we have gone ahead and expressed our criticism quite openly. When commenting on the Report during its presentation to the general public in Rome, Angelo Cardinal Bagnasco defined is as an act of love for Europe. It certainly is an act of love for Europe, but not for the European Union. At the end of the Report’s introductory synthesis undersigned by myself and the directors of the six research centers that contributed to it, including the Livatino Study Center, we state that help for Europe will come precisely from those now criticizing the present situation of the European Union, doing so also in resolute terms. The radical nature of our assessment also stems from the fact that, in our opinion, the errors in the overall approach are also to be attributed to the original project, and not just to possible hitches and deviations later on in time. Present at the outset were two projects: the first outlined according to the principles of the Social Doctrine of the Church, and the second according to the Manifest of Ventotene . It must be recognized that the latter won the day, while the process of unification progressively moved farther and farther away from the former, doing so hand in hand with the secularization of European society. The Manifest of Ventotene perceived the process of unification as a revolutionary and socialist endeavor led neither by peoples nor through peoples, but rather by a vanguard of intellectuals and politicians, who would have imposed it from on high. It was an Enlightenment-inspired and Jacobin-like project, and, with all due respect for the necessary distinctions, Leninist as well. It involved the idea of molding the European people anew, and, in keeping with Rousseau’s thinking, giving it another nature. The overall plan was the same as that of Italian Massonic liberalism which, once having ‘made’ Italy, wanted to work from on high to ‘make’ or rather ‘remake’ Italians. Then again, only in this spirit – as we will see later – is it possible to understand the ideological commitment of the European institutions and even the birth of a pro-European ideology. Europeanism today is an ideology that demonizes those who contradict it, accusing them of populism. The Manifest of Ventotene stated how the European Union had to be erected, and also stipulated its cultural contents, identifying them with those implicit in the ideology that conciliated Gramsci with Gobetti, socialism with liberalism, statism with respect to public needs and amoral individualism as regards public life. In other words, it was a project of the radical society, or as Augusto Del Noce argues, an irreligious and opulent society. As we indicate in our Report, there was a moment in the history of the European Union when this overall schema could have been challenged. We refer to 1989 and 1991, that is to say the collapse of Communism in eastern Europe. As we know, this was interpreted as the need to move ahead towards political union with the Treaty of Maastricht (1992), but could have also been interpreted in another way, as so insistently called for by John Paul II. The request to include the reference to God in the European constitution was driven not by integralism, but by the wish to channel reflections about Europe back to their authentic sources so it could once again find the pathway proper to it. The Union would take its distance from Europe, while John Paul II wanted the process of unification to be at the service of Europe, from the Atlantic to the Urals. This was why it had to reconnect with its Christian origins, but the pathway embarked upon was entirely different, and the repeated statements made by John Paul II fell on deaf ears. The European Union had two reference models in the history of Europe: the model of the Empire and the model of the modern State. The Empire model was a wise equilibrium deeply set in the history between center and periphery, reductio ad unum and coexistentia membrorum, identity and plurality. Nations and peoples were valued, and at the same time unified by the common religion and the imperial role. The dusk of empires coincided with the end of World War I, and also disappearing from Europe with them was the public role of religion. The other model was that of the modern, absolute and centralized modern State that sacrificed coexistentia membrorum under the hallmark of reductio ad unum. This is the modern Leviathan which, as Carl Schmitt wrote when commenting on Hobbes, was Man, God, animal and machine at one and the same time. The European Union did not become a Super State in formal terms, but did assume many features and functions typical of the Leviathan. It turned into an enormous machine of bureaucrats and officials, who were all alike and shared the same pro-European ideology that ended up by coming down to two elements alone: formal democracy and liberty bereft of substance. It is necessary to give some serious thought to the artificial nature of the European Union’s construction. Hobbe’s Leviathan is an artificial construct without any relations with the social nature of man, and with nary a debt towards a state of nature that would curtail its absolute power. Even though the European Union asserts it is at the service of nations and peoples, it is actually an artificial construct of treaties managed by an artificial class of bureaucrats, and has an artificial culture likewise bereft of any linkage with natural moral law. Proof of this is the fact that the member States are systematically subject to undue pressure on the part of the European institutions to pass laws contrary to life and the family, contrary to the dictates of the natural moral law with which the European Union has cut all bonds. The so-called “new rights” are sustained by the cultural mind frame of the European Union, are at the very center of many recommendations issued by European Parliament, and are defended by the European Courts of Justice to the degree that an ordinary citizen who files suit against his own country’s legislation regarding the right to life, for example, is practically defenseless. Imposed upon the applicant States during the phase of preparation leading to admission to the Union is the condition to enact legislation on these “new rights”, without which the States in question would manifest their discriminatory nature. Underway in the European Union is a cross-cutting battle over this theme of human rights both within States and among States. The member States of the Union are very divided over this, both among one another, and within their own borders. The organizations of civil society that defend the right to life and the family made up of man and woman stand in opposition against progressive groups that want to extend the new rights to individual self-determination above and beyond any moral and juridical rule. The European institutions ordinarily side with the latter, but are not able to avoid social and political conflict over issues such as these. Moreover, those who defend natural law see the European institutions as foes, thereby heightening dislike for them. When the Trump administration in the United States cancelled the allocation of funds to organizations that champion mass abortion, the European Union partially made up for the ensuing shortfall by increasing the budget item earmarked to that end, thereby becoming the number one funder in the world. The dispute within countries now exists among countries. Many eastern European countries have constitutionally secured the natural family, or the negation of the public recognition of homosexuality, or the right to life from conception to natural death. These countries are in ideological conflict with the European institutions which have mounted opposition against them. Anthropology is becoming the terrain of European division to an ever increasing degree. The Union’s tendency is to ensure uniformity, but some countries are now reacting against the effort to reduce one and all to the same level. The four Visegrad countries – Poland, the Czech Republic, Slovakia, and Hungary – lay claim to their own cultural, religious and ethical identity against the European leveling off ideology. Evident on this terrain of the cultural and religious identity of European peoples are the major symptoms of the deficit in the unification process. The nexus between people and culture is fundamental. While an undoubtable fact is the existence of a European culture, albeit difficult to clarify in light of the notable quantity of its component parts, equally undoubtable is the fact that it issues forth from the cultures of the individual peoples that it absorbs within itself and levels down to uniformity. As John Paul II taught us, culture is a road towards human nature that transcends all cultures, relativises them, and makes an ethical assessment of them possible. Peoples strive to achieve the human nature common to man along diverse pathways, which means according to their respective cultures. Cultures are not self-referential and count insofar as they reveal man as he is, placing themselves at his service. This is why it is also possible for negative elements to worm their way into cultures when they do not respect man. In such a case, human nature assumes the role of a criterion for the judgment and moral assessment of the culture in question. Once human nature has been removed from the picture, however, ‘the’ culture is customarily established by the powers-that-be among themselves. Europe has always been a crossroads for cultures and peoples, a crossroads rendered possible by common reference to human nature, with this reference guaranteed by Christianity. In fact, matchless is the vision of the human person which saw the light of day in Europe and was then transmitted to the western world not as the expression of a biased culture, but as a universal achievement. Nowadays, however, here is exactly what is happening in Europe: people have taken their leave from human nature, and hence also from the cultures of peoples and nations which they would like to render uniform and blend artificially like in a meat grinder. Emerging on our continent are new claims to the right to one’s own cultural identity, and this is often done in open dispute with the European institutions. Culture, however, is also other than this. John Paul II also taught us that culture always issues forth from man’s fundamental question about God. All cultures have always had a religious origin. As Benedict XVI has also taught us, the modern, Enlightenment-inspired culture is the only one born without God and against God. Born in Europe was the world’s first anti-religious culture intent on ensuring a systematic expulsion of God from the public sphere and which then spread beyond the borders of Europe. The expulsion of God from the public sphere is what led to forms of totalitarianism in Europe. The ideological State came into being with the French Revolution precisely due to the expulsion of God from public life, and then continued in other and even more devastating forms. The basic question is as follows: does eliminating God from the public sphere make the European Union an ideological power as well? Without God, cultures inevitably wither and rotate around themselves, also losing sight of other human and secular values in a process of dissolution, or, as Carl Schmitt would say, a process of dispersion. Both Carl Schmitt and the historian Ernest Nolte have argued that the birth of the ideological State in Europe has always been the cause behind the outbreak of civil wars: for example, in revolutionary France, in the Germany of the Weimar Republic following the defeat in World War I, World War I itself, Nazism against the Jews, what happened in Italy after 25 April, and what went on in Soviet Russia after the October Revolution. . .all civil wars. People now say that the process of European unification has brought peace to reign on the continent. This is partially true, but only if we overlook what happened in Bosnia and the Kosovo half way through the 1990’s, and today ignore Crimea and the Ukraine. Characteristic of the ideological State, according to Mr. Nolte, is the presumption of guilt. . . .against a Jew or a middle-class capitalist. The overriding mind frame in Europe today also espouses presumption of guilt: in this case against unborn children, and the European institutions are very active on this front. If we take a close look at the construction of the European Union and its current situation, we can see that rather serious indeed are the shortcomings with regard to the fundamental principles of the Social Doctrine of the Church. Particularly evident is the distance between what is happening and the two fundamental principles of common good and subsidiarity. Explicit in the vision of the common good set forth in the Social Doctrine of the Church are two aspects now being completely ignored in Europe. The first is that the common good is behind us before being ahead of us. Parts of it are the natural order to which we belong and the historical order of the tradition from which we receive principles and values. The common good is an ethical order, not a material one. It can also be present in a situation of poverty as long as no violence is perpetrated against the natural order of things. The pro-European ideology, on the contrary, is based on the idea that what comes from the European institutions is ‘the good’, and that there are no objective orders to be respected. The second aspect of the common good is its vertical nature: the first common good is God, upon Whom the selfsame legitimization of authority is based. The European Union, however, has embarked upon the pathway of highly exacerbated religious secularization based on indifference towards the truths of religions that are all considered equal and different, with not a single one of them deserving any special public role. Then there is the principle of subsidiarity. The Treaty of Maastricht contemplates this principle, but also deforms it by interpreting it in an instrumental and functional sense alone. Said principle only has a sense in a system of social and moral order where the societies below must be enabled to act freely in order to perform their respective objective duties. Were this not to be so, the principle becomes no more than a claiming of spaces for the exercise of alleged individual rights not anchored to duties. Prevailing are two erroneous visions of subsidiarity: the first considers it a form of largess on the part of the sovereign State to the societies under it, and the second looks on it as a libertarian and anarchic claim on the part of said societies themselves. In both cases it has no firm anchorage in an objective social and political order. I would like to conclude this brief overview of the European Union from the viewpoint of the Social Doctrine of the Church by flagging the fact that in the Union there is no political vision of the Islam issue insofar as a political problem. Islamic parties have already presented candidates for election in many European countries. As the philosopher Remi Brague has written, when Muslims are imported into a country, actually imported is not a religion as such, but rather a civilization. In Islam there is no concept of natural law, ethics coincides with what is permitted or forbidden in religious terms, divine revelation immediately possesses a juridical sense as well, the community prevails over the individual, there is no concept of person as developed in the Christian west, the anthropological inferiority of women compared to men is a fruit of revelation, obeying Mohammed is tantamount to obeying Allah because the written Koran conforms perfectly to the eternal Koran, the Muslim community is anthropologically superior compared with all other communities and spreads through conquest. In the European Union there is no policy regarding Islam and people fail to take into account the following fact: Islam is not just a religion. Europe’s hollow laicity is unable to respond to Islam. Osservatory Cardinal Van Thuân, Europe: the end of illusions, IX Report on the Social Doctrine of the Church in he world, edited by Giampaolo Crepaldi and Stefano Fontana, Cantagalli, Siena 2017. Alfredo Mantovano, Il futuro dell’Europa tra manifesto di Ventotene e Dottrina sociale della Chiesa, Ibid. pgs. 157-172. Gianfranco Battisti, Europa, le morte ragioni di una crisi epocale, Ibid. pgs. 123-146. Cf Carl Schmitt, Sul Leviatano, Introduzione di Giancarlo Galli, Il Mulino, Bologna 2011; Id., Legalità e legittimità, Introduzione di Carlo Galli, Il Mulino, Bologna 2018. Stefano Fontana, “Ex captivitate salus”: se sia ancora attuale il concetto di “guerra civile europea”, Ibid. pgs. 147-156. Cf Le ragioni del bene comune, single-subject issue of “The Bulletin of the Social Doctrine of the Church”, XIII (2017) 1. Cf. La sussidiarietà, un principio da recuperare, single-subject issue of “The Bulletin of the Social Doctrine of the Church XIV (2018) 1. Marie-Thérese Urvoy, Islamologie et monde islamique, Cerf, Paris 2016; Annie Laurent, L’Islam, Artége, Paris 2017; Pierre de Lauzun, La laïcité française est incapable de répondre à l’islamisme, Liberté Politique, n. 68, janvier 2016, pp. 143-146.; Bernard Dumont, La France, les catholiques, les musulmans, Catholica n. 130. Hiver 2016, pp. 12-18; Giulio Meotti, Il suicidio della cultura occidentale. 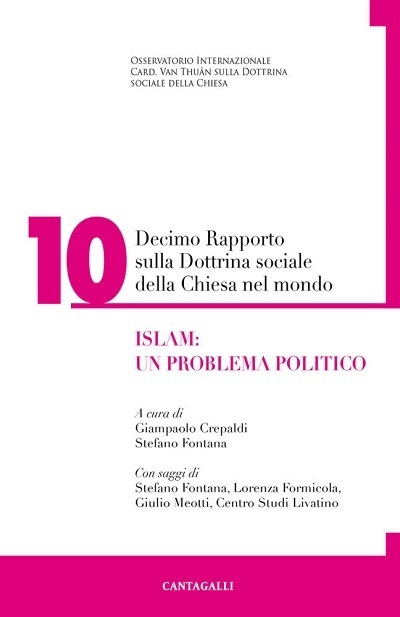 Così l’islam radicale sta vincendo, Lindu, Turin 2018; Id., La fine dell’Europa. Nuove moschee e chiese abbandonate, Cantagalli, Siena 2016; Gianni Baget Bozzo, Tra nichilismo e islam. L’Europa come colpa, Mondadori, Milan2006.